The family of the 45-year-old Mayan homeless man shot by police near a Mission District tent encampment on April 7 filed a federal civil rights lawsuit against the city and the two officers involved on Friday. The lawsuit was filed on the six-month anniversary of Luis Gongora Pat’s death and comes on the heels of an autopsy report released last week. The family has argued that nothing in the report argues against filing criminal charges against the officers involved. “[The autopsy] confirmed what we already suspected – that Mr. Gongora was not a threat at the time those officers used deadly force against him,” said Adante Pointer, a civil rights attorney representing the family of the slain man. The autopsy report states that six bullets riddled Gongora Pat’s body, some piercing his back and sides, while one shot to his head proved fatal. But the report also details Gongora’s prior run-ins with the law and that the homeless man had drugs in his system at the time of his death – information that advocates say is superfluous and an attempt by the city to disparage Gongora Pat’s character to protect the officers. According to police, Gongora Pat was armed with a knife and lunging at Officer Michael Mellone and Sgt. Nate Stegar on April 7, forcing them to dispense a round of bean bag bullets before firing actual gunshots. Pointer said that the family is seeking to recover monetary damages, but more importantly, the lawsuit is a crucial step in pressuring the police department towards accountability and reform. “We are focused on making sure that this does not happen again in the streets of San Francisco,” said Pointer. In June, the family filed a wrongful death claim against the city, and their lawyer said that the autopsy is confirmation that Gongora Pat was shot while “on the ground or going to it,” and did not pose a threat to the officers. Video evidence suggests that Gongora Pat was shot within 30 seconds of the encounter. 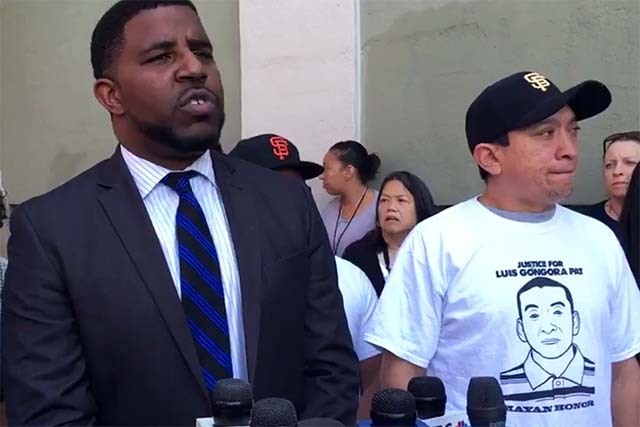 Gongora’s death sparked a 17-day hunger strike outside of the Mission Police Station in May, and was one in a series of contentious police shootings that ultimately resulted in the resignation of then-Police Chief Greg Suhr. Despite consistent pressure from community advocates, the police department and the district attorney’s office have yet to charge the officers in any of the recent shootings. In light of a recent push by the city to clear out the Mission’s homeless encampments, increased scrutiny of biased policing practices, and the ongoing search of a permanent police chief, the lawsuit comes at a critical time and could set a precedent on how police interact with marginalized communities. “Most people [in encampments] that I’ve talked to have this impression that what happened to Luis Gongora sends this message that if you’re out on the street in a tent, you’re not a human being – you’re a throwaway person,” said Mission Supervisor David Campos. At the press conference, Campos said that one of the biggest obstructions to police accountability in officer-involved shootings is the influence of the department’s police union. So far, police officers involved in recent shootings have been shielded by the department. In Gongora Pat’s case, direct-eyewitnesses reported intimidation by police in the days after his death. “The police department and the city [came] back to this very neighborhood, essentially intimidating witnesses, hauling off their property and their goods in the middle of the night and harassing them endlessly,” he said. Stephanie Grant was a resident of the encampment and witnessed Gongora Pat being gunned down by the officers – at the time, she was eight months pregnant and homeless. Grant says she is now clean and in a women’s residential program, has a five-month old boy, and that her story about what happened the day Gongora Pat was killed has not changed.